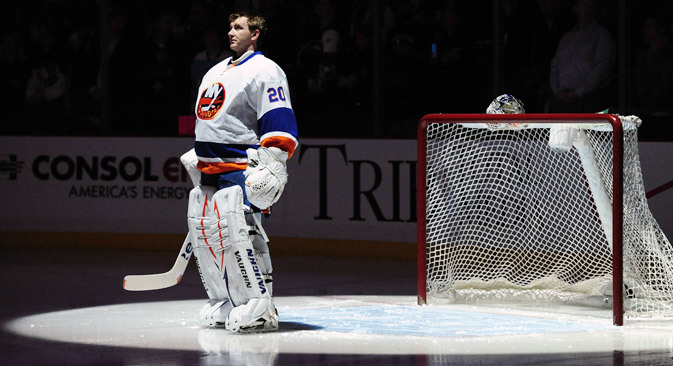 Will Nabokov leave the NY Islanders for Russia? A member of the extended Russian Olympic Hockey Team and a goaltender for the New York Islanders, Evgeni Nabokov talked about recent rumors of his possible return to Russia, the Sochi Winter Games and his plans for the upcoming season. R-Sport: What do you think of the Olympic preparations in Sochi? Evgeni Nabokov: We were given a great deal of useful information. We saw the places where we will live and where we will play. The place where the team will be staying during the Olympics is now just a frame structure, and finishing work is being done on it. However, it is clear that the living conditions will be great. I was impressed by the main sports palace: It is simply an awesome building. R-Sport: How does it feel to be back on the national team after several years of absence? E.N. : It is always nice to come to the national team. We talked with each other and with the coaches. Zinetula Bilyaletdinov and his assistants told us what they expected from us now, and also during the Olympics. R-Sport: Did you expect this invitation, given the bad experience on the national team in previous years? E.N. : What do you mean by bad experience? Do you mean the last Olympics? Four years have passed and much has changed. You know, I do not sit at home thinking, “When will I get a call from the national team?” My task is to do my job well and to hope that, one day, I will get an invitation. The coaching staff of the Russian national team makes the decisions, not me, as to whom to invite or not invite. R-Sport: This year could be called one of the best in your career. The Islanders finally made it to the playoffs with your help. E.N. : Yes, the season was very positive for the team. It was short, but dynamic. We fulfilled one of our tasks—we made it to the playoffs. The Islanders took a great step forward. However, now we are facing greater challenges, and it will be much more difficult to take the next step. We will have to make the playoffs again, but the tasks will be very different this time. I think that this season will be much more difficult for us than the previous one. R-Sport: There were rumors that you would either be locked out or would try to go back to the KHL after the season ends. Is any of this true? E.N. : To the KHL!? Did someone seriously write this? I have never heard of this until now. To be honest, I have never even considered the possibility of returning. These rumors are mere gossip. In addition to the Islanders, I have other options in the NHL; but, after signing of a new contract, it is pointless to speak about this. R-Sport: So, there is no point in discussing your return to KHL clubs in the near future, is there? E.N. : Do you think, given that I went back to the NHL for family reasons, after just two years I would seriously talk about returning to Russia? My family has not changed. No, at this time, I do not see myself in the KHL. What the future holds, I don’t know. R-Sport: Taking into consideration your experience of playing in Russia, were you surprised by Kovalchuk’s decision to move to the SKA? E.N. : I think like everyone else and I did not expect this. However, Ilya has made a choice for himself and for his family. He believes that things will be better for him there. Those who condemn Kovalchuk’s action are simply stupid people. He does what is best for him and for the people closest to him. R-Sport: In Russia, all the talk about hockey boils down to February and Sochi. Won’t the thoughts of February prevent you from preparing and playing for the Islanders in the upcoming months? E.N. : Everyone understands that this is the year of the Olympics, and the Games are very important for the country. However, you should understand that playing for our own club is no less important. Moreover, one supplements the other here: If you play badly for the club, you will not get to the Olympics. Therefore, each of us thinks about playing the first club game and later we will think about the second game; and then, in February, we will think about the Olympics. Now we have to prove to the coaches that we deserve to play on the national team, and I can only do this with the help of good games with the Islanders. Believe me: I will not be thinking 24/7 about the Olympics. R-Sport: Are you ready to go to the Olympics even as the third goaltender? E.N. : I do not understand why everyone considers me a reserve player. We have a coaching staff, and none of them has said anything about who will be the first goaltender and who will be the second or third. I am happy to be on the national team, and that is enough. R-Sport: Were you surprised that Ilya Bryzgalov was not present at this session? E.N. : Yes, I was surprised a little. Ilya is a very good goaltender. However, that's just it: There are lots of good goaltenders, but the coaching staff can select only three.